Sketch Class Saturday – Let's Paint Nature! “There’s nothing free in life.” Said the pessimist. 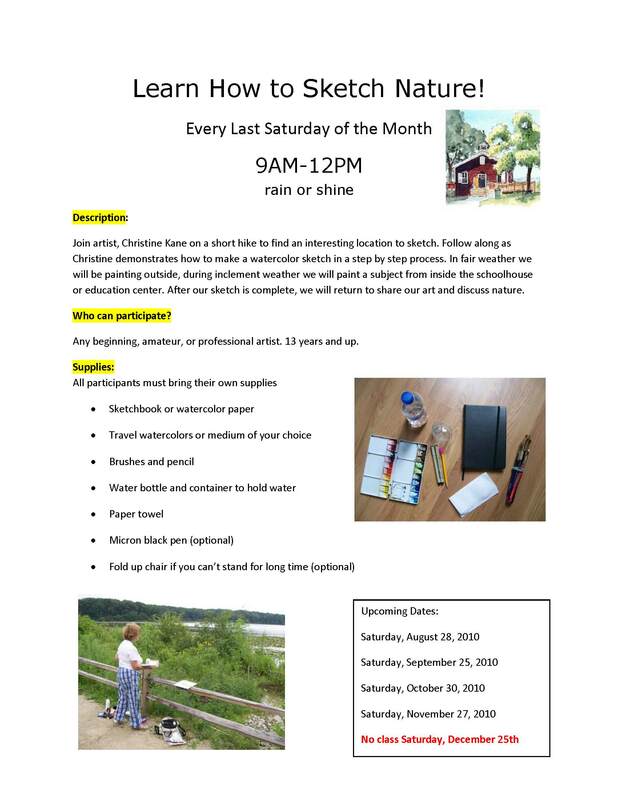 Just a friendly reminder, this Saturday is the next free plein air sketch class at the Little Red Schoolhouse Nature Center. If you are in the Chicago area and would like to attend, meet at the schoolhouse at 9AM. Unless specified, we are going to try to establish a regular date, every last Saturday of the month. Artists can paint as they watch me do a step-by-step watercolor demonstration or they can go off on their own and sketch what they like, returning to the education center at 11:30am to discuss art. For address and supply list, click here to view the class page. I’m looking forward to joining you. The last sketch class made me feel so relaxed and I carried that with me all weekend long! I looked at my painting the other day and love the way a painting changes after it dries completely – I love the memories making art creates. Christine, you have shown me how making some little sketch every day feeds my soul. Thank you. Alanna: Great quote and thank you for joining me, what a great experience! I had so much fun on Saturday during the second sketchcrawl! The next day, I rode my bike over to a pond near my home and painted an egret fishing for his lunch. I am so grateful for the encouragement I am receiving from Christine to put the brush in my hand and play on the watercolor paper! The time passes too quickly though – one moment its 9:15 am and the next it’s noon. Thank you again, Christine. I look forward to September 25th!